It must be one of the most beautiful locations for a gallery. Not just as a site, but also in terms of modernist architectural history. Doing research for the forthcoming Marseille specialist guide we came to visit the recently opened MAMO art gallery on the Unité d’Habitation roof terrace, created and run by French designer Ora Ito. The space has been restored to its original plan and there is now also a bookshop and a small cafe. Designed by Le Corbusier in the late 1940′s the Unité building itself is like a giant piece of sculpture. It belongs to a modernist dialogue, where ideas about space and proportion were going through dramatic changes. The building sits in an oblique angle on Boulevard Michelet and the views from its roof terrace over the Mediterranean horizon are pretty amazing. For our Sydney correspondent Julia Champtaloup it was her first visit to this imposing site. 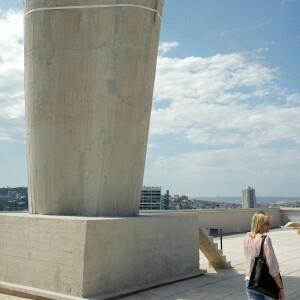 She was moved by the sheer scale of it all and the beauty of proportions, although not a Corb enthusiast like myself. The program at MAMO is supported by Audi and the first show is by French artist Xavier Veilhan. He is a sculptor and his Architectones art projects have previously explored three modernist houses in L.A. with an interest in the spatial relationships in architecture. Julia had seen his mobiles exhibited just before in the Hong Kong Art Fair at Galerie Perrotin. It was fantastic to see this exceptional architectural space being used in a way, which for sure re-articulates ideas from Le Corbusier’s original plan. Now the old gymnasium has been given a new life and is free for all to visit. More to follow in our specialist Marseille guide in July.